Adam Ashley-Cooper says he is not worried about Australia's form ahead of Bledisloe III and the 2019 Rugby World Cup, hinting he may soon be back in the mix himself. The 34-year-old, who has earned 116 Test caps to date and last played for the Wallabies in August 2016, left the Waratahs in 2015 to join Bordeaux-Begles in the Top 14, before joining Japanese side Kobe Steelers in 2017. Speaking exclusively to Sky Sports Rugby in Japan, Ashley-Cooper was adamant - despite sharing a changing room with nine Kiwis - the Wallabies' current form (three wins in last 11 Tests) is not a concern. "The boys are certainly doing it tough, but I'm not worried," he said. "I'm certainly not worried - there's a long time before the World Cup kicks off and a lot of football to be played before then. "The boys have made it pretty tough for me but you can't question the All Blacks performance against the Aussies anyway - just world class. They are No 1 in the world for a reason. "And to be fair actually, the Kiwi boys here have been very supportive! A few pats on the back, a couple of bum pats! But it's been good. "I haven't really gone into too much depth about it with anyone in Australia. Maybe because they've been doing it tough, I haven't really wanted to ask those questions. "But I am in regular contact with a few of the guys. We remain quite close. But more than anything, it's just momentum, confidence and belief. "They are just in a bit of a position at the moment where they're stuck and not finding their rhythm the way they should in order to win Test match football. "They've come up against quality opposition, you can't deny that. But it feels like they're just lacking a little bit of spark, and little bit of consistency. But it wont take long before you can turn that around. "They've got the talent and the potential to do that. They certainly have the coaching staff to do that. "Like I said before, I'm not worried at all. We're still 300 odd days out from the World Cup, and that's so much time, so much football. "There's a whole Super Rugby season where a lot of the individuals can go back and play with their provincial teams, build their confidence and work on those combinations they may come across in the international season. "And then there's three or four Tests prior to the World Cup, and obviously that pre-camp before travelling here. There's so much time to grow as a team." 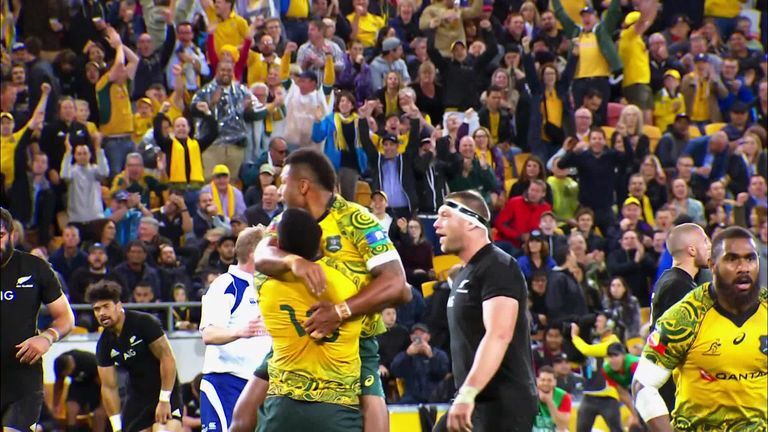 On Saturday, Michael Cheika's Wallabies face the All Blacks in Yokohama, live on Sky Sports Action & Main Event, for Bledisloe III, having lost Tests one and two heavily during the Rugby Championship. The Wallabies were victorious in this corresponding fixture last year, however, and taking the Test to Japan could prove something of a leveller. Ashley-Cooper says the country is ready and raring for rugby. "The Japanese, particularly here in Kobe, got around Bledisloe III months ago, and started counting down to it from maybe 400 days out! "There's signs everywhere, everyone's really getting excited. I mean it's great for rugby here in Japan. "It's already taking off and there's already a huge buzz behind it but the World Cup is going to be a great kick for them. Gail Davis sat down with Dan Carter and Adam Ashley-Cooper ahead of Bledisloe III in Japan. "There's always chat, particularly over the last couple of years, of Bledisloe III being a dead-rubber. It's not for the Aussies, and it's not for the All Blacks either - even though they've wrapped up the series anyway. "They'll still want to go out and perform. I know now speaking with the likes of Dan Carter, Andy Ellis and all the other Kiwis here, how much it means for them to play Australia, regardless of what's on the line. "There's such rivalry and such tradition behind it. It's a really special Test match. So the boys will certainly get up for that and I'm really looking forward to watching them." With the World Cup now less than a year away, the sight of Ashley-Cooper donning the green and gold again is not one which has been given much thought. But with the Top League in Japan condensing ahead of the country hosting rugby's showpiece competition in 2019, Ashley-Cooper is on the lookout for a new club. And admits his heart is set on a return home. "It would be amazing to play in another World Cup, but there needs to be a few miracles before that happens, let me tell you! "I think the way that next year is structured, there's no season up here in the Top League so I'm kind of looking to play football somewhere to keep going as a player and upskilling. "The worst thing I can do is not play. I'm 34 and if I stop for that period of time, I'll probably seize up and not be able to get out of it. "There is interest [from clubs] and I think at the end of the day, I've just got to sit down and ask myself what I really want to achieve. What are my goals? What's my motivation? And that's for me to work out. "Any rugby player, while they're playing rugby, wants to play in a World Cup. It's a special tournament. "I've been fortunate enough to play in three, and they've been the best rugby experiences of my life. "Any aspiring rugby player wants to play for their country and wants to represent their country at a World Cup, so that would be amazing. But there's a lot of hard work that needs to go in before that happens. And selection certainly isn't guaranteed. "I know there's certain criteria that I pass (over 60 caps if playing outside of Australia), but that means nothing because the guys back there at the moment are performing really well and have been playing in a test window for a long time now. And I've only been playing Top League, so it's certainly against me. "At the moment I've just got to work out what I want to do individually, and what I'm doing at the start of next year. "There hasn't been too many conversations with Cheika because he's got a lot on. But I think in terms of experience and myself, (Matt) Giteau and (Drew) Mitchell, who came back for the last World Cup, there are guys there at the moment with a lot of experience and there's no doubt they're learning a lot from the last few Tests. "Those types of learnings are absolutely key going into such a critical tournament next year. So the likes of Kurtley Beale, Bernard Foley, Matt Toomua, Michael Hooper, David Pocock, they'll be taking a lot out of these losses. "I'm not worried about them, like I said before, and I actually think it puts you in a better shape leading forward into a World Cup. Will Ashley-Cooper be in line for a return to the Waratahs in Super Rugby? "Our last World Cup, we had a limited prep for that because Cheika took the reigns at the end of 2014, had to deal with his Super Rugby team, only had a few Tests before going to Chicago for our World Cup prep. And we ended up getting to the final, so it certainly can be done. "That's the best thing about World Cups. It's tournament football, it's momentum, and after the first four games, anything can happen. It's sudden death. "My heart says go to where you're going to play your best football. Where I can play and contribute and add value. "Somewhere in Australian rugby. I've got the time to do it and that's the beauty of next year for me. I have the potential to give it one last crack because I can."